Dr. Fred A. Bonner II is on a mission to dispel the notion that “good scholarship” — particularly research on African-American and other minority populations — can only be done at elite predominantly White institutions. Bonner, who holds an endowed chair in Educational Leadership and Counseling at Prairie View A&M University in Texas, has been busy at work building the Minority Achievement, Creativity, and High Ability Center (MACH-III), a comprehensive research center at the public historically Black university (HBCU). Although it is still in its formative stage, MACH-III is almost certain to become a game-changer in the way that research is done on minority populations. The center’s mission is clear: to produce best practices and scholarship that examine the contemporary issues that impact critical populations such as administration, faculty and students across the P-20 spectrum and beyond into workplace contexts. 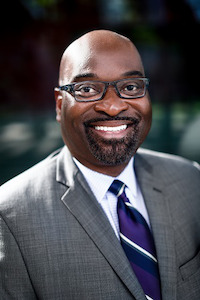 Bonner, the center’s executive director, launched the enterprise with a Texas A&M University System Chancellor’s Research Initiative (CRI) Grant in 2015 that provided the initial funding for the creation of the spacious center that is housed within the Whitelowe R. Green College of Education at Prairie View. Several years later, Bonner says that he has a laser focus on developing asset-based approaches to research on critical populations that will establish Prairie View and the MACH-III Center as a “preeminent clearinghouse and national model within academe in general and Minority Serving Institutions (MSIs) in particular. In a relatively short time, MACH-III is already off the ground, with a committed staff of four and widening interests from scholars across the country who have turned to the Center and Bonner to help find research solutions for some of the nation’s most vexing problems. Indeed, when Bonner announced in 2014 that he was leaving Rutgers University — where he held the Samuel DeWitt Proctor Endowed Chair in Education in the Graduate School of Education — to join the faculty at Prairie View A&M University, few expected that he would simply teach. The author of dozens of publications, Bonner developed a solid reputation as a research-practitioner and created several successful initiatives, including the HBCU Deans’ ThinkTank and a Black Male Summit. Having held teaching and administrative stints at Texas A&M, University of Texas at San Antonio, Bowling Green State University and Centenary College of Louisiana, Bonner established his bona fides as a doctoral student at the University of Arkansas, Fayetteville back in the 1990s. That rigorous training has catapulted Bonner into one of the nation’s top thinkers on issues that affect African-American students. His research on African-American “gifted and talented” male students has expanded the field. Tammy Lane, a fifth-year doctoral student in Educational Leadership, remembers hearing Bonner deliver a talk on developing a research agenda and was excited to later learn that he was joining the faculty. Bonner, whom colleagues describe as unusually energetic and driven, has been barnstorming the country, applying for grants and reaching out to potential funders who are interested in supporting the Center. The response, so far, has been encouraging. In addition, he and his staff have been providing ongoing presentations, lectures and roundtable discussions at convenings throughout the world, most recently in Paris at the International Centre for Innovation in Education, where he accepted the International Award for Excellence in Higher Education on behalf of Prairie View. In 2018, Bonner and MACH-III will host the international forum in Texas, the first time to be held in the U.S. and to be hosted by an HBCU. Dr. Nicholas D. Hartlep, associate professor of Urban Education and chair of the Early Childhood and Elementary Education Department at Metropolitan State University in St. Paul, Minn.—a Minority Serving Institution—invited Bonner to serve as the inaugural Dean’s Visiting Urban Teacher Education Research Scholar. MACH-III’s continued expansion comes at an ideal time. Prairie View has recently been thrust in the national limelight in the wake of Dr. Ruth Simmons’ decision to come out of retirement to lead the 142-year-old institution. Simmons made history when she was appointed president of Brown University, the first and so far the only African-American to lead an Ivy League institution. After holding teaching and administrative posts at Minority Serving Institutions and Predominantly White Institutions, Simmons’ decision to help Prairie View’s ascent to national prominence mirrors Bonner’s commitment to the institution as well. “Ruth,” as she prefers to be called, even by students “has been extremely supportive of MACH-III,” says Bonner, who like Simmons is a native Texan. 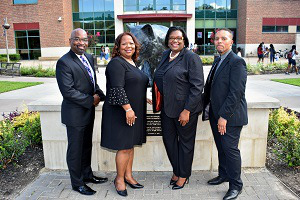 Bonner has also won over support from his colleagues at the university, including Dr. James A. Wilson Jr., associate provost for academic affairs and director of the Honors Program at Prairie View. He says that MACH-III represents the future of HBCUs. At a time when many scholars still face resistance for wanting to research and write about people of color, Bonner is creating a space for that work to be done, says Dr. Stella L. Smith, associate director of MACH-III. Dr. Kamala V. Williams, the center’s editorial and creative services specialist, agrees. “I feel like I’m needed here and appreciated here and the work is appreciated,” says Williams, who is supporting the efforts of the center by establishing a peer-reviewed research journal, which will highlight the research undertaken at the Center. Lewis of UNC Charlotte says that other HBCUs should consider replicating Bonner’s model. For his part, Bonner remains steadfast in his desire to help move his research agenda. “What has been the most exciting part for me is having this idea in my head and seeing it operationalized through not only programs and initiatives but through the people, and also building a team with people who are just as excited about this vision and mission toward the goal of creating this research center,” says Bonner.